Diamond grinding-assisted electro-discharge (DGAED) machining is a hybrid machining process which can be used to improve the material removal rate (MRR) for the difficulty to machine materials like superalloys, ceramics, and composites. 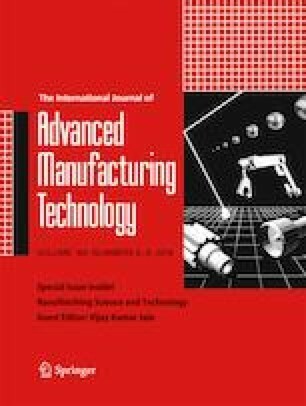 The main aim of this paper is to develop a model for DGAED machining of titanium nitride-aluminum oxide (TiN-Al2O3) ceramic composite for predicting MRR. TiN-Al2O3 ceramic composite finds industrial application due to its properties like high resistance to abrasion wear, chemical stability, hardness, and low friction coefficient. The characteristic features of DGAED machining of the TiN-Al2O3 ceramic composite are explored through response surface methodology (RSM) for face-centered central composite rotatable design (CCRD) with seven-center-point scheme. Wheel speed (S), peak current (I), pulse on time (ton), and duty factor (DF) are taken as control factors while MRR is taken as the performance parameter. The experimental results for MRR are analyzed and regression equation for material removal rate is obtained. The surface topography shows that melting and thermal spalling are primary material removal mechanisms. Microcracks and micropores are found diminished on the machined surface and MRR is improved as the wheel rotation speed increased. This paper is a revised and expanded version of a paper entitled “Parameter Optimization of Diamond Grinding Assisted EDM of TiN-Al2O3 Ceramics Using Taguchi Method (AIMTDR-415)” presented at AIMTDR-2016 from December 16–18, 2016, at COEP, Pune, India.